We seek to recruit interdisciplinary translational project (ITP) teams from universities and industry nationwide that align with our clinical indication priorities in dental, oral, and craniofacial tissue engineering/regenerative medicine. Our first RFP was issued in May 2017 and the first cohort of eight ITP teams was selected in November 2017. A second cohort of four teams was selected in June 2018, followed by a third cohort of five teams in December 2018. We are not currently soliciting proposals at this time, but here are our most recent RFP and FAQs for prospective teams. 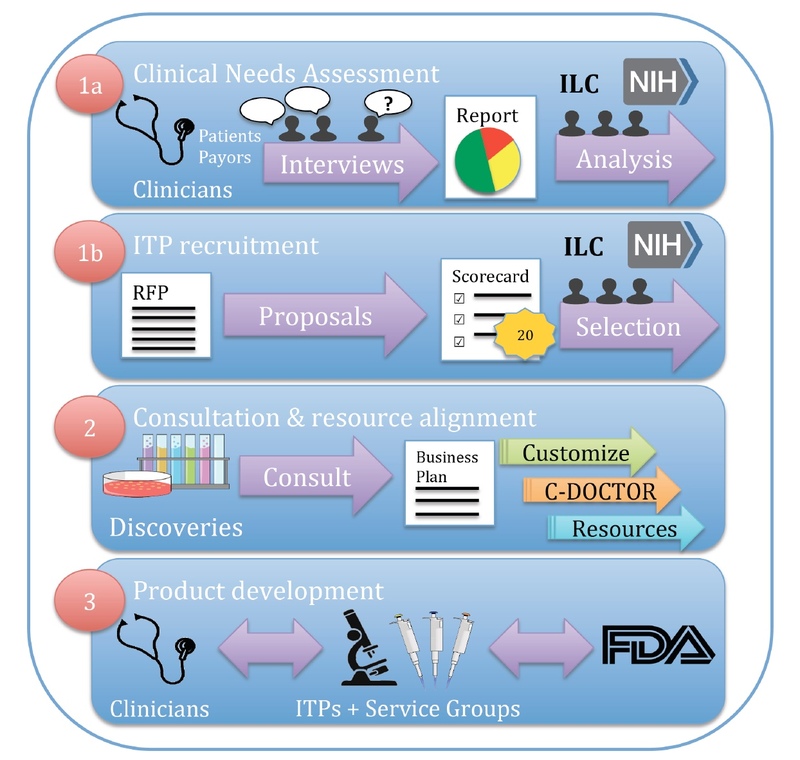 We are developing an ITP team pipeline, as shown in the figure at right, through a process of structured innovation, during which we recruit, select, and advance only those technologies that optimally align with priorities of four key stakeholder groups — providers (clinicians and healthcare networks); producers (industry); payors; and patients. Peri-implantitis is a devastating complication of dental implant therapy, where bone loss leads to functional and esthetic complications, often ending in implant loss with significant medical burden and health care costs. Unfortunately, no therapy exists to regenerate bone around implants once it is lost, leaving a major unmet need, where treatment will have a large market and immediate clinical adoption. The objective of this project is to generate and optimize an osteoconductive, light curable adhesive hydrogel with modifiable physical properties and the ability to regenerate osteogenic tissues. Although the immediate unmet need is peri-implant bone regeneration for the thousands of patients with ailing dental implants, these strategies and protocols will be applicable to other dental, craniofacial, and orthopedic markets where bone regeneration challenges are extremely common. As dental implants have become the standard of care for tooth replacement, postoperative complications affecting the peri-implant tissues have emerged as a serious health concern. Peri-implantitis (PI) constitutes the leading cause of implant failure. PI refers to a severe inflammatory process affecting the soft and hard tissues surrounding an implant, which is characterized by a progressive loss of the supporting bone. Currently, there are no commercially available products that combine high adhesion to soft and hard oral tissues, and antimicrobial and osteoinductive properties for the treatment of PI. The goal of this project is to engineer an osteoinductive, antimicrobial, and growth factor-free hydrogel adhesive for treatment of PI, which can be rapidly crosslinked in situ via exposure to visible light. Calvarial defects are common in patients with craniofacial birth defects and diseases. Stem cells combined with biomimetic scaffolds offer a bio-inspired solution to problems like this one, holding the potential for excellent neuroprotective and aesthetic outcomes. Our ITP team is using mesenchymal stem cells (MSCs) delivered on a 3D-printed scaffold to regenerate bone to fill a calvarial critical-sized defect (CSD). We aim to improve care for patients with calvarial CSDs and will fill an extensive need in a sizable market. Our success in this project will also have a direct impact on using 3D-printed scaffold and MSCs in bone regeneration to repair other skeletal defects. Craniofacial injuries from trauma, burns, radiation, and surgery often result in hypertrophic scar (HTS) formation. HTS may cause disfigurement and psychological distress, and is associated with exorbitant healthcare costs. We have demonstrated that activation of focal adhesion kinase (FAK) during the healing process results in excessive scarring. Our porcine model has revealed that disrupting this signaling pathway through topical delivery of a small molecule inhibitor of focal adhesion kinase (FAKI) is effective in reducing scar formation and improving the attributes of the healed skin in deep partial-thickness excisional wounds. We propose to implement clinically-relevant non-invasive scar assessment techniques, and complete certified GMP manufacturing of clinical grade FAKI hydrogel patches in preparation for an investigator-initiated clinical trial. We have found that activation of ALDH3a1 enzyme, which is enriched in salivary stem cells, increased stem cell yield, and preserved saliva functions after irradiation in mice. We have discovered a natural product compound, Alda-341, that selectively activates ALDH3a1, is safe to use in humans, and when given to mice, can preserve saliva function after radiation without tumor protection. Therefore, we propose to conduct additional animal studies to optimize the duration of Alda-341 treatment, the sequencing between Alda-341 and radiation therapy, and human studies to determine the distribution of the drug to salivary glands. Soft tissue defects following cancer resection of the head and neck present a reconstructive challenge with substantial medical burden. Adjuvant radiation therapy can be highly effective at reducing local recurrence, however detrimental collateral changes including macroscopic discoloration, loss of skin elasticity, microscopic obliteration of small vessels, and dermal thickening make management difficult. To mitigate some of these changes and facilitate reconstruction of irradiated defects, we have developed a transdermal drug delivery system to provide sustained cutaneous delivery of deferoxamine, an FDA approved iron chelator for treatment of acute iron poisoning and chronic iron overload. Local iron chelation can also in increase revascularization of ischemic tissue, and we have already demonstrated local injection of this medication to reverse many hallmarks of chronic radiation-induced soft tissue injury. Our proposal seeks to evaluate the effectiveness of transdermal deferoxamine delivery to improve blood flow and skin biomechanics of irradiated tissue, as well as to determine the ability for our novel patch to improve fat graft based reconstructive strategies. Development of therapeutic suture devices that can accelerate the reestablishment of tensile strength in high risk, high tension wounds can significantly minimize wound dehiscence and hypertrophic scarring to improve functional and aesthetic outcomes. To this end, we have found that a fibromodulin-derived peptide (PGP) can significantly promote fibroblast migration and increase wound tensile strength in both rodent and pig models. Additionally, PGP-coated absorbable surgical sutures showed a 50% increase in wound tensile strength compared with control non-peptide-coated sutures in porcine models, which are preferred by the US FDA for testing human cutaneous products. Given the broad indication for surgical sutures, using a gel formulation that can be applied with any suture configuration may provide application flexibility and a streamlined manufacturing strategy for commercialization. Thus, the goal of the current C-DOCTOR ITP Team award is to develop and accomplish key efficacy objectives to expedite the commercialization of a peptide-impregnated gel-type device that can be applied with any suture configuration (with respect to needle specifications, suture composition, and size) for accelerating the reestablishment of tensile strength and minimizing wound dehiscence. If successful, this product can significantly improve the quality of life of patients suffering from poor wound healing or dehiscence. Temporomandibular joint disorders (TMJDs) are a multifaceted group of chronic pain disorders characterized by pain and/or stiffness in the jaw, limited jaw mobility and pain when opening or closing the mouth. TMJDs are relatively common, with incidence rates in the range of 5-12%, with nearly twice as many women as men being affected. One of the primary cause of TMJDs is arthritis, with both rheumatoid and osteoarthritis associated with the condition in between 40-75% of the cases. We have recently discovered a novel class of small molecule regulators called Regulators of Cartilage Growth and Differentiation (RCGD 423), acting as a modulators of gp130 receptor. One of these molecules selected for drug development evidenced a remarkable ability to prevent cartilage degeneration and induction of catabolic enzymes and promote cartilage repair, respectively. Preliminary studies have also shown strong anti-degenerative and anti-inflammatory effect of RCGD 423 in a rat model of TMJ arthritis. Current proposal will demonstrate proof-of-concept efficacy of RCGD 423 following the previously described large animal model of TMJ arthritis. We predict that this compound could represent a novel, first-in-class treatment for TMJ-related arthritis that could have a major societal impact. Our initial product is an autologous stem-cell derived replacement tissue implant returning functional salivary neotissues to patients with hyposalivation disorders after radiation therapy. We hope to expand to the allogeneic market after proof-of-concept including biointegration and return of salivary flow. From normal, resected salivary tissue, stem/progenitor cells (hS/PCs) are isolated, expanded, and encapsulated in customized hyaluronate-based hydrogels where they form functional salivary neotissues. We have strong evidence that hS/PCs can differentiate along all salivary lineages. Using two radiated models, we are examining integration of implants with host tissue to determine if neotissue produces saliva to relieve xerostomia and restore oral health. Future development as an allograft can expand the market to the millions of individuals worldwide with hyposalivation disorders. This project aims to translate the Polymer-Induced Liquid Precursor (PILP) method into a clinical approach as part of a restorative dental treatment procedure. The PILP method has been used successfully to functionally remineralize artificial lesions in dentin by restoring its mechanical properties through intrafibrillar collagen mineralization. In this grant we are designing novel dental cements to release PILP-components and test their ability to remineralize natural lesions in carious dentin of extracted human molars in order to demonstrate the feasibility of these cements for use in a clinical setting. Ultimately we aim to generate a dental device that conserves tooth structure and allows the functional repair of dentin through remineralization previously not possible. This project aims to translate a topical therapy to prevent the development of radiation or chemotherapy induced oral mucositis. By combining tehniques for sustained release HB-EGF with a mucoadhesive drug delivery system we are able to reduce the development of oral mucositis. If we achieve this we will have an impact on one of the more costly side effects of cancer treatment. Bone defects due to trauma, age or bacterial infection must be surgically treated due to their low potential of repair. Several strategies have used implant surface modification or coating with antimicrobial agents to prevent bacterial colonization and biofilm formation. The antibiotics used to treat bone infections are given intravenously or orally, through antibiotic-releasing bone cement, or collagen sponges. Collectively, these approaches have shown limited effectiveness due to the lack of site specificity, uncontrolled release, and ineffective control over microbial growth. Our goal is to develop a 3D printed, calcium phosphate microbead with tunable properties, sustained drug release, and increased material strength. The composite will deliver antimicrobials and osteogenic agents designed to induce osteogenesis, control infection and produce a reparative tissue. When completed his system will offer ‘streamlined care,’ an integrated diagnosis, design and on-site manufacturing that will deliver fast effective and affordable treatment. Non-healing radiation wounds of the craniofacial region that result after treatment of head and neck cancer are a significant burden associated with pain, disfigurement, and poor quality of life. Wounds that do not adequately respond to existing conservative therapies may require surgical intervention. However, not all patients are eligible surgical candidates, which in the case of a non-healing wound, presents an unsolvable scenario. Our proposal is an innovative solution to this difficult problem. Based on prior work demonstrating utility of fibronectin in irradiated wounds, we will develop a fibronectin-based 3-D transglutaminase hydrogel (3dTH) which allows for controlled delivery of protein. A prototype will be tested in a minipig neck wound model in order to study the therapeutic effects and work toward the development of a prefabricated wound dressing suitable for human clinical use. Development of a user-friendly, easily applied and replaced dressing for head and neck wounds would improve patient outcomes and reduce the healthcare burden. Osteonecrosis of the jaw (ONJ) is a significant complication following prolonged or high dose bisphosphonates (BPs) used for cancer. ONJ occurs in 1/100,000 to 1/250,000 of the patients receiving intravenous BPs. Preexisting gum disease (periodontal disease, PD) often proceeds ONJ. Currently, there are no effective medications to reverse PD-induced bone loss and slow the progression of ONJ. It is an un-med medial need for non-surgical therapeutic options to treat bone loss induced by PD and to re-vascularize the dead bone and regenerate new bone in the necrotic area. We have developed a compound that has a high affinity to the bone and improves bone homing of both the endogenous and the exogenous stromal cells (MSCs), which has an Investigational New Drug (IND) application in place and currently is in Phase Ib clinical trial. The current proposal’s goal is to test this compound with or without the combination of MSCs in preclinical models of PD-ONJ. Our data, as well as those from others, have confirmed that MSCs have paracrine effects that to reduce inflammation, and to restore angiogenesis and osteogenesis when they are positioned within the bone microenvironment. We expect the success of this research will lead to a new approach for augmentation of anti-inflammation, angiogenesis, and bone regeneration, which are essential elements for the treatment of bone loss and to repair osteonecrosis.